Home » Blogger Tips » Search Engines » SEO » Tutorial » How to Enable and Customize Blogger Robots.txt File? How to Enable and Customize Blogger Robots.txt File? Hi ! In this tutorial I am going to show you how to edit your Blogger blog robots.txt file. Webmasters use custom robots.txt file to control search engine web robots (also known as Web Wanderers, Crawlers, or Spiders) to crawl some directories and web pages or links of website or blog. when we take settings robots.txt file in blogger then search engine automatically index or remove pages from search engine according to the settings. 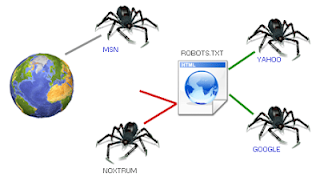 By default each website allows the Search engines robots however if you would like to restricts the robots either to not crawl any bound directory, file or the complete website then you may want the robots.txt file in which you've got to write instructions for search engine bots. you can see a message " Enable custom robots.txt content? " so press "Yes" and proceed to next step. Now you can see text area, type the content which you want to exclude a content from crawling. How to block Link from search engines? (www.bloggerknown.blogspot.com/p/about.html) then, in the robot.txt file you will enter this command. I know this post is not a new thing but I hope it might help many newbies to understand the importance of robots.txt. Bro My Blog Homepage not search on google top search Result..
block the search engines to my entire blogs? Still confused, After lot of search still i am not found the perfect solution of robot.txt. Please help me How to allow sites to crawl my web. hey admin please tell me that i have two blog domains and i want to change the first on into second can u help me ! Dear go to blogger Settings › Other and Export blog download xml file and go to second blog settings and import xml file. All post of first blog publish on second blog. Thanks. Very thnk u, but is there any drawback or harm in doing this and my first blog data will stay in that blog or not. It will not make any harm to your blog. And your first blog data will be safe. Nice post ! very useful Thanks Muhammad Azeem. Am a blogger in http://talkzoom.blogspot.in Thanks!